Award-winning director Michael Anton has seen first-hand the impact dementia has on seniors and their families through his work with Newhaven Court at Lindwood senior living community. The Jeannette native has combined his passion in the arts and his commitment to senior care as director of the play “Absence,” which puts a spotlight on dementia. The award-winning play by Peter M. Floyd will be presented by Newhaven Court at Lindwood on April 26 at the Palace Theatre in Greensburg. 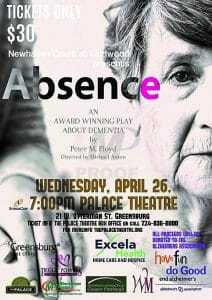 The play will begin at 7 p.m., and all proceeds will be donated to the Alzheimer’s Association. Tickets are $30. “The Alzheimer’s Association Walk has had such a significant impact in regards to spreading awareness and raising funds to support Alzheimer’s research, but in the end there is still a significant hill to climb in regards to educating the general public to the effects that this disease has on both the family and the person or persons suffering from Alzheimer’s,” said Anton, who won a 2016 NYLA International Film Festival Award for the documentary “Democracy Road” and has completed seven films to date. “Absence” features the talents of Linda Stayer, one of the most prominent theatre actresses in Westmoreland County during the past 30 years. Stayer has starred in dozens of productions, most recently “Cabaret” at the Lamp Theatre. She currently is being considered for the lead role in Anton’s next film, “In the Valley of the Wandering Minds,” which takes place in a memory care unit. Newhaven Court at Lindwood Executive Director Lori Grant was moved after watching one of the rehearsals for the play. She believes “Absence” drives home the impact of dementia from multiple perspectives. Anton said his goal is to raise awareness to the effects of Alzheimer’s disease through the portrayals of the actors. The cause is important to Anton, who has worked in healthcare for more than 13 years. He won the 2012 Aster Award for writing and designing a Hospice booklet for families interested in services. Anton currently serves on the Alzheimer’s Walk Committee for Westmoreland County as the Advocacy Chair. Those familiar with Newhaven Court at Lindwood know him as the senior community’s director of sales and marketing. He uses his full name Michael Anton Monsour in his Lindwood role. His cousin, also named Michael Monsour, is an actor who starred in the movie “Everybody Wants Some” (2016). The cousins have worked together in the past. The dual career path may produce a challenging and sometimes hectic pace, but Anton would have it no other way. The play also will include a silent auction of artwork by residents from senior living communities throughout IntegraCare, which operates Newhaven Court at Lindwood as well as nine other communities in Pennsylvania and Maryland. Anton said any senior community, facility or agency that purchases a block of 10 tickets will receive one free ticket and have a logo placed in the play’s program. Ticket information may be obtained through The Palace Theatre Box Office at 724.836.8000. For more information visit mmonsour@integracare.com or 724.853.2505.